We are thrilled to share that Chimborazo Elementary School is now a fully authorized International Baccalaureate (IB) World School, Primary Years Programme (PYP)! 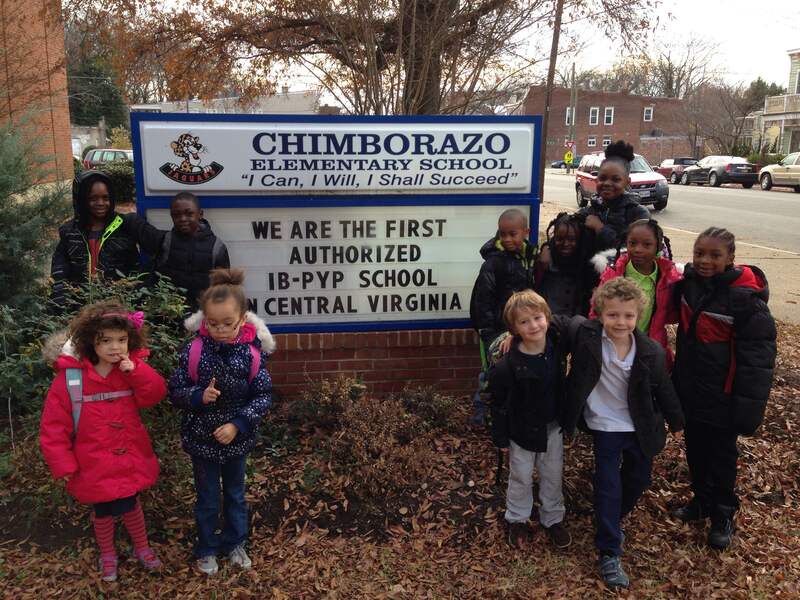 In September 2010, the Chimborazo PTA, with support of then Principal Cheryl Burke, voted to conduct a feasibility study to see if the PYP would be a fit for Chimborazo. Since that time, the school has been engaged in an IB candidacy process. The Chimborazo teachers and staff who have worked many long hours to help the school receive authorization. Special thanks goes out to Molly Muse and Sirez McCoy who, in addition to their teaching duties, have been co-coordinators in ensuring that the staff receives proper training in an IB education. Also, we thank Interim Principal Lancaster-Gay for her tireless support during this last year. Chimborazo parents and community members (too many to name) who volunteered in many different ways including: attending task force meetings, designing – selling and installing yard signs, fundraising, baking goods, hosting info-parties, volunteering at neighborhood festivals and PTA events. Our city leaders including our School Board Member, Don Coleman, for ensuring that this effort remained a priority on the School Board and our City Council Representative, Cynthia Newbille, who was important cheerleader and helped direct significant City Council funding for this project. Chimborazo’s retired principal, Cheryl Burke, who retired last June, helped Chimborazo believe that they were ready make a transformational change and helped get this process started. RPS Instructional Specialist for Gifted Programs, Anthony Washington, for guiding the school towards authorization and helping with training. Every person who contributed financial resources to help this effort raise approximately $400,000 to ensure proper training, accrediting fees and materials were available for the school. This effort is a shining light for what a public/private partnership can accomplish for the good of our children! In recognition of this huge accomplishment, there will be an IB authorization celebration party – likely in January. More details will follow. Awesome!! So exciting to hear. Congratulations, Matt and everyone else involved! What wonderful news! What a monumental week for the children of ChurchHill. CHAt’s fantastic news followed by Chimbarazo’ s achievement. Congratulations to all the grown ups, who worked so hard for the children!! I am so pleased to hear this! The amount of work from all of you to achieve this was undoubtedly monumental. For 3 years, I served on the original BOD for the Patrick Henry Charter school as a motivated parent determined to provide sone choices for those of us that did not want to move out of Richmond to educate our children. What a fantastic option you’ve added for Richmond School district parents! THANK YOU!!! This is great also!!!!! I love living in Church Hill! Congratulations! Thank you for all your hard work -great news for Church Hill! Your aspirations and hard graft have resulted in a transformational change for the Church Hill / Chimborazo community and thousands of students will now have a great start in life – all down to you and the staff. A great team effort !!! As the parent of an IB graduate, I can tell you this is a wonderful opportunity for the students of Chimborazo. Many, many thanks to all who helped make this possible. You have given an incredible gift. This is terrific news for Church Hill. Can children outside of the Chimborazo district attend the school? If yes, then what steps does one take to do this? Congratulations! What a GIANT accomplishment for the city schools & Chimbo. I hope to see more movement in this direction in the city. I love living in the city and don’t want to move to a surrounding county or pay for private school for my child to get a good education! Although this accomplishment is huge, our neighborhood schools still have great needs for committed volunteers. If you’re not involved in some way, please consider calling your local school to find out about tutoring opportunities as a math or reading buddy. Several of the schools have full time staff members who help volunteers know how to best plug in. You could also join the PTA – and help with fundraisers.